In ancient times a beautiful, and unwilling, bride was being carried north by her family. When they came to the cliffs at Rosh Hanikra she threw herself into the sea, never to be seen again. 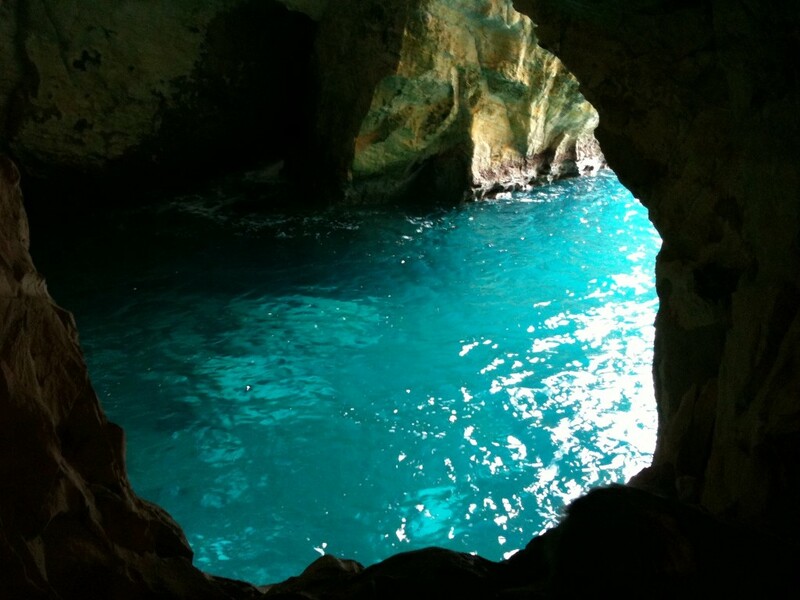 Her sighs can be heard to this day as the waves wash into the caverns beneath the cliff. Poetic, but total rubbish of course – and pretty much on a par with the rest of Rosh Hanikra’s claims to fame. Rosh Hanikra sits literally on the border with Lebanon and comprises a series of grottos hollowed out of the chalk cliffs by the seas. You begin your visit by descending on what’s billed as the steepest cable car in the world. Our own experiences seemed to contradict this and a bit of internet research reveals a great many cable car rides claiming that title. So while I’d love to be able to say, as we expected when we set out, that we went on a record-breaking cable car, I’m not sure I can do so with head held high. (Although as one of the other claimants to the title is a cable car we’ve been on in the Blue Mountains, perhaps we’ve already ticked that box). At the base of the cliffs you enter a disused railway tunnel to see a short movie describing the history of the area. Although there is no indication that this is the case, our judgment was that we had to have gone under the border with Lebanon by walking to the end of the tunnel. We found that quite exciting, but we’re assuming that the touchy nature of the border precludes the Israeli attraction making anything of it. Either that or the disputed nature of the border means no one’s quite sure where to draw the line. Judged against the surface though, the tunnel clearly ends after the, demarcating, rolls of barbed wire on land and the chained buoys at sea. The tunnel was part of a large railway system built by the British during WW2. Well, it was built under British rule, but the engineering was done by New Zealanders and some of the building was done by Australians. Perhaps it’s an indication of how long we’ve been away from home, but we got quite excited by that. The railway fell into disuse after it was bombed in 1948 by Israeli fighters in the war of independence. The actual grottos were, we all agreed, somewhat underwhelming. Nice enough certainly, but they probably needed some rougher seas or brighter sunlight to be really worth the visit. On an average, slightly grey day like today they were not a big hit. No mater though, we didn’t have any better plans and the ticket price was included in the compendium pass we’d bought to see all the sights around Akko. The coffee and milkshakes at the top were worth the trip anyway. The boys were honestly more taken with a stop further down the coast where we skipped stones on the Mediterranean and searched amongst rock pools for anything of interest. The rock beach was bordered by huge banana plantations; which gave us cause to think of home again and poor Queensland ravaged by storms.